The white Sauvignon is used for our dry white wines alone or blended. The Muscadelle is a very aromatic cultivar. It is used for dry wines and can produce in good years wonderful late harvest wines. Mauzac is a specific cultivar of Gaillac and Limoux. It is a perfect cultivar for sparkling wines. In dry wines -brut- it develops aromas of green apple. Len de l’El in Occitan or Loin de l’Oeil in French, litteraly far from the eye, is a native cultivar of the Gaillac area. The grape has a long peduncle and is far from its junction on the vine shoot -the eye- which gives its name to this type of grape. This cultivar gives floral aromas and of citrus fruits. 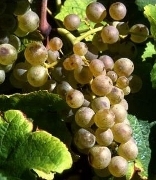 It is used for dry white wines and is well-adapted for late harvest wines thanks to its thick skin. Merlot is blend in our red wines where it gives smoothness and blackberry aromas. Duras is native from Gaillac and we use it mostly for rosé. Syrah or Shiraz is a cultivar mostly found in the South of France and in the Rhône Valley. With global warming it tends to develop northward. In Gaillac it gives very good results and is featured by spicy aromas. Braucol, also called Fer servadoux or Mansois is mostly cultivated in the areas of Gaillac and Marcillac. Braucol has a good ageing potential on clayish soils that also bring out its blackcurrant aromas. Our Gamay is dedicated to the production of "primeur" by the Rabastens cooperative.